Why are aliens, drones, and cyborgs invading the runway? Are we suddenly hurtling to a very real sci-fi future? In 1999, as the world teetered on the brink of the millennium (and panicked about the ‘Y2K bug’, which was predicted to wreak havoc over computer systems), Alexander McQueen showed a Givenchy collection which imagined women as robots. Dressed in reflective circuit board bodysuits that appeared to glow from the darkened runway, the finale saw a model who had been transformed entirely emerge from backstage, her naked chest enclosed in a perspex case which was lit up with tiny LED bulbs. In that moment, McQueen’s collection did what all good sci-fi does: it offered escapism through fantasy, and acted as a prism through which we saw our own cultural conditions and anxieties. It sounds tired to state that fashion is a form of escapism, though; it can also be just as much about reality. But with the dystopian state that politics are in right now, designers are turning to technology, post-humanism and sci-fi to tell their stories – this season alone saw shows reference The Matrix, aliens, cyborgs and 21st-century dystopias. Dolce & Gabbana even sent handbag-bearing drones down the runway, prompting jokes that even their usual cast of millennial influencers are set to be replaced by technology. Something else to note is that this focus on alternative fantastical universes isn’t only happening in fashion. Last year’s must-read novel The Power imagined a world where young women were capable of shooting deadly electricity from their bodies, while the afrofuturist story of Black Panther is currently smashing box office records. Earlier this month, and about two days after we’d examined why the style of 1999’s The Matrix felt relevant right now, Alexander Wang presented a Trinity-esque take on power dressing at his final NYFW show. Featuring sharp, tailored looks and more than a few shoulder pads, the presentation – held in the decidedly nondescript former Vogue offices on Times Square – climaxed as model Sora Choi stalked the beige-carpeted catwalk in a patent trench coat and dark, rectangular glasses. (Back in ‘99, the runways saw John Galliano get inspired by the film too – his infamous ‘Matrix’ collection for Dior – widely regarded as one of his best – offered a couture vision featuring high shine PVC and electrifying neons). But the most headline-grabbing example of this future-facing escapism came courtesy of Gucci’s Alessandro Michele, who looked to Donna Haraway’s 1984 work A Cyborg Manifesto for AW18. A seminal work of post-humanist theory, the text proposes a complete rejection of binaries and throws the notion of identity into complete disarray. Haraway uses cyborgs, monsters and hybrids to blur lines: Michele took these references literally, playing mad scientist and creating his own ‘Gucci cyborg’ “a biologically indefinite...creature” with a “mongrel identity”. In a show set that resembled a clinical operating theatre, models clutched baby dragons and severed, unnervingly realistic replicas of their own heads, while others had their heads adorned with extra eyes and prosthetic horns. The operating theatre setup also pointed towards scientific progress; Michele’s creatures were mythical, but recent cloning breakthroughs and the rise of Sophia the Robot, who has already been given her first cover story, are more literal examples of theoretical post-humanism – we’re hurtling towards a very real sci-fi future. By blurring lines between human and cyborg, Michele transported his guests into a post-human, post-identity future, although his controversial use of turbans on non-Sikh models also raised the question of just how well cultural theory translates onto the runway. While Michele was busy designing for his mutant models, Miuccia Prada was recruiting AI Instagram star @lilmiquela for an AW18 takeover. The virtual influencer ‘posed’ for show selfies and even staged a tour of the venue, viewed through the lens of a drone controlled by her iPhone. This mimicked the ways in which we all view reality: fragmented, filtered and condensed into pixels we can all manipulate at will. 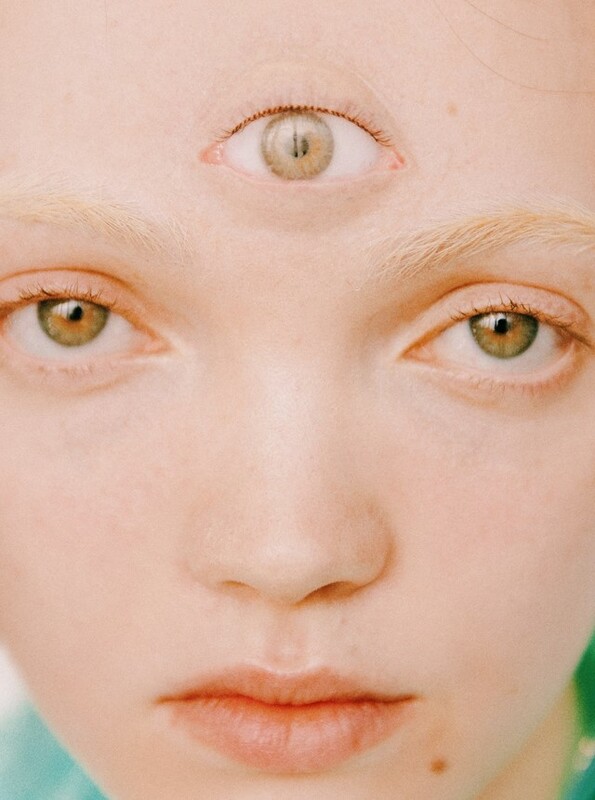 The show hadn’t even started, but Miquela’s presence was undoubtedly a commentary on today’s Facetuned Instagram culture, designed to explore the technologically-driven, rapidly disintegrating lines between fiction and reality on social media. The collection itself, Prada said, was designed for women to venture unafraid into the night (the actual night, visible from the windows of the show space, was punctuated with Prada fluorescent lights). Glow-in-the-dark neons kept models visible even in the consuming blackness of the runway, while the Prada flame motif jutted weapon-like from a series of wedge heels. Iconic looks were catapulted into the future, with a sci-fi twist coming in the form of those tiny glasses which shimmered like oil. Against the backdrop of #metoo, the show felt like a kind of techno-escapism, positing a futuristic feminist utopia where women rule the streets after nightfall. 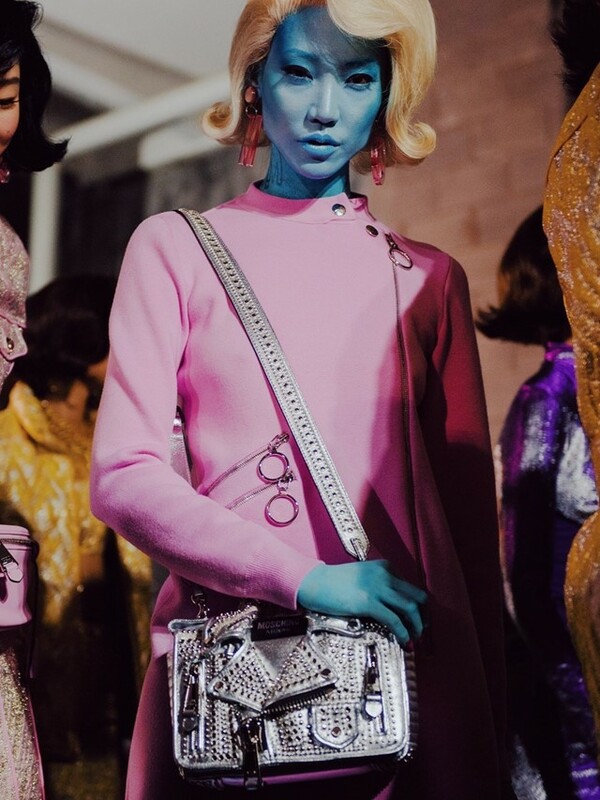 At Moschino, designer Jeremy Scott blended both past and future, reimagining Jackie O and Marilyn Monroe in alien and android form on the runway. Several licks of body paint were the most obvious visual translation of this idea, but there were also satin evening gowns which featured spliced-in silver sequins as if somebody had tripped a switch on a group of hyper-glamorous robots and sent them into a glitching meltdown. There was a more political message woven into the show, specifically one focused on immigration. “There’s this whole talk of the ‘other’, of ‘illegal aliens’,” Scott lamented of America’s current political situation. “I was playing with the idea of what you think an ‘alien’ looks like,” he continued, before highlighting his desire to destabilise the practice of assuming someone’s history from a single glance. In a world of fake news, Scott sought to call ‘the truth’ into question – and to create a kinder reality in the process. Fashion may not be able to remedy the political dystopia which is the world today, but it can at least offer fantasy-fueled respite and create a visual cultural commentary on our situation. It’s hard to ignore the fact that we’re hurtling towards a future in which drones fly down runways, robots replace models and our Instagram feeds are flooded with hyper-real avatars, but in many ways this reality may be more attractive than the one we’re currently living in. We can’t ignore the facts, but we can embrace technology and use it as a tool to build better futures – without Instagram, for instance, model Anok Yai wouldn’t have found her way onto the Prada runway. And that’s certainly a cause for celebration.